» Filed Under: Trading Theory. It’s been a while since I posted anything to this site – and the reason is not sheer laziness. It is because I had what might be called an epiphany a little over a month ago – one of those “bright lights in the sky” kind of moments, and that’s what I want to write about here – what I’ve called the “hidden secret” of cyclic theory. The other reason it’s been such a long time since my last post is that I’m currently directing So You Think You Can Dance and Strictly Come Dancing (the South African versions) … and those shows take up a lot of time! So what is this “hidden secret”? Cyclic theory (at least the aspect of cyclic theory that Thinking Trading Software uses, as defined initially by JM Hurst) is based on the idea that stock market price movements are the result of the complex combinations of many different cycles. They differ in amplitude (in other words how much price movement they cause), and also in period (how long between each cycle trough – also called wavelength, or the inverse of frequency). I have mentioned elsewhere on this site that one of the differences between JM Hurst’s theories (and the theory TTS uses) and many modern day practitioners of cyclic theory is that Hurst constantly emphasised the fact that many cycles combine to produce a composite price movement, whereas the modern team generally talk about cycles in isolation from one another – there is much talk of “identifying the dominant cycle”, and then trading on the basis of that cycle only. That’s all very well, but the hidden secret I believe I’ve stumbled upon is all about the ways in which the many cycles combine, and illuminates the reason why tracing only a single cycle can be so disastrous to one’s trading account balance. Let me start at the beginning, and try to explain. The basic cycle (of which Hurst says there are many, in fact an unlimited, infinite number), looks like your standard sine wave. Above this paragraph (if I’ve got the formatting of this page correct) is a graph showing two complete cycles of such a sine wave. Let’s assume that this wave is a depiction of the 54-month (4 & 1/2 year) cycle, believed by Hurst to be present in the movement of stock market price movement. That means that something (call it “social mood” or “the X factor”) is causing prices to rise and then fall as depicted in this graph – one complete cycle (up then down) in 4 and a half years. That’s all very well – but this doesn’t look much like a graph of a stock market price, and that’s because a stock market price is moved by a combination of many cycles! So let’s start combining them! Now in this graph (should be above this) I have combined two sine-wave cycles, using Hurst’s Principles of Harmonicity, Synchronicity and Proportionality. What this means is that the waves have periods that are a small integer multiple of each other (in this case 2 – the pink wave has a period that is 2 x the period of the blue wave), and the troughs of the waves, where possible, occur at the same time (synchronicity), and the amplitudes of the waves are proportional to their periods (the pink wave is 2 times the amplitude of the blue wave). The white line is the combination of both these sine waves (using the Principle of Summation, which basically states that you add them up!) Now the point I’m getting to is that a trough in the blue wave (the same 54-month wave depicted above) appears differently to another trough of the same wave, depending on the influence of any longer cycles. So imagine that you were trading this 54 month cycle – you would want to buy at the trough of the cycle, and sell at the peak. If all you did was consider the 54 month cycle, you would have made a very disappointing trade at point A in the graph to the left. Although you have correctly identified that point as being a trough of your trading cycle (the 54-month cycle), the price move up from the trough (as shown by the white line) is very disappointing – it is completely different in scale to the price move up from the trough positioned at the extreme left of the graph. So the point I’m making is that one cannot trade cycles in isolation – one has to consider the cycle in the context of all cycles longer than it. OK, so I’ve demonstrated that by simply considering the cycle one up (the cycle with the next longest wavelength) from your trading cycle you can avoid some disappointing trades. What happens if you consider more than that? Take a look at the graph above. The blue cycle in this graph represents the nominal 18-year cycle – which is the cycle two up from the 54-month cycle (the 9-year cycle is the only cycle between them). Now look at the white line that is once again the summation of all the cycles considered (in this case every cycle from 20-weeks up to 18-years). I have marked the 54-month troughs with the red arrows A, B & C. Now that we are considering two longer cycles, the effect of the 54-month troughs on the composite price movement (in other words the price movement created by combining all the cycles) are very different. If you’d bought at point A, a 54-month trough, you would have made a pretty profit. Same thing at point B, just with a slightly differently shaped curve on the upward path. Then, emboldened by two successful trades of the 54-month cycle, if you had bought at point C, which is a genuine 54-month trough just like points A & B, you would have been in for a nasty surprise … the price bumps up for a moment (apparently confirming your decision to buy) … but then it plummets. There is of course another 54-month trough that I haven’t labelled, at the extreme left of the chart. Buying at that point would have positively made you think you were a trading genius because of the way the price rocketed up for about 6 years! 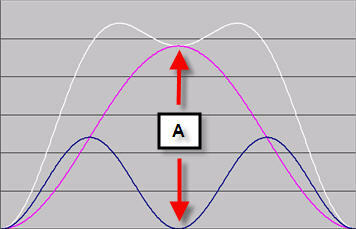 Unfortunately the situation is even more complicated than combining two cycles as described above. Hurst mentions in his work that the longest known cycle is probably 18 years (and that was back in the 1970’s), and one might ask why one should need to know about cycles any longer than that … well this is the hidden secret I’ve been trying to get to: I believe one does need to know about the longer cycles, all of them (even if they are all lumped into one imperfect and slow movement – what Hurst calls Sigma L) because, as I hope I’ve demonstrated, the longer cycles have a great impact on the effectiveness of the shorter cycle troughs as buying points. And so one final chart. In this chart I have combined all cycles from 54-months up to 54-years. I believe there are two alternatives for the cycle one up from the 18 year cycle – a 36-year cycle, or a 54-year cycle. 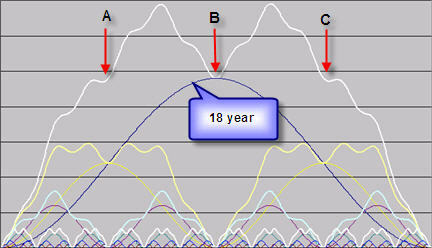 The 36-year cycle has a wavelength 2x as long as the 18-year cycle, and the 54-year cycle has a wavelegth 3x as long. 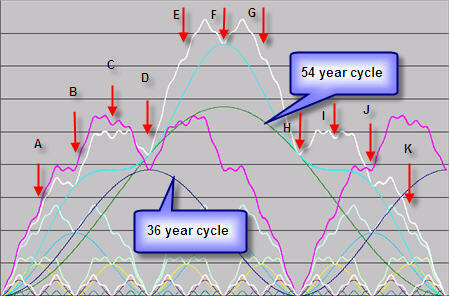 I prefer the idea that the 54 year cycle is in fact the next wave up, because of the symmetry with Hurst’s 18-month to 54-month cycles, and also because 54 years is generally considered to be the length of the Kondratieff cycle. But without actual evidence, I’m unwilling to commit to either, and in any case we need not only consider the 36/54 year cycle, but also all cycles longer than them, so the Sigma L “cycle” will by no means be a perfect sine-wave cycle itself. What I have done in the chart to the left is demonstrated both the 36-year cycle (the blue line, composite price is the pink line), and the 54-year cycle (the green line, composite price is the white line). I have again labelled all the troughs of the 54-month cycle with red arrows, labelled from A to K, and of course there is another trough at the extreme left (or right, because they are the same trough) of the chart. Take a look at each of those arrows, and I think you will agree that trading the 54 month cycle is not merely a matter of buying every 54-month trough. One has to know what is happening to all the other cycles, in order to know whether a particular 54-month trough is likely to result in an impressive price rise. Consider for example point K – that is a 54-month trough, but I certainly wouldn’t want to buy there (irregardless of whether the longer cycle is 54 years or 36 years). One can only trade profitably using cyclic theory if one is able to identify all of the cycles impacting upon a particular stock’s price movement at any one time. It is a mistake to say that because price is at the trough of any particular cycle, it will necessarily rise to a degree commensurate with the wavelength of that cycle – the impact of a particular cycle is governed by the status of cycles longer than it (what Hurst calls the underlying trend of a cycle). Choosing one cycle (as the dominant cycle) is therefore no good as a trading strategy. It was this “epiphany” that has had me working hard at having Thinking Trading Software take this idea into account, and be able to identify the shape of the Sigma L (or sum of all longer cycles) “cycle”. I am getting there … slowly. My earlier posts to this site with analyses are, I believe all still valid, but they have a critical missing factor – which is what I guess I could call the Sigma L, or underlying trend factor. Over the near future I’m going to be revisiting all the commentaries and analyses I’ve made using TTS, and re-evaluating them in the light of the software’s new “Sigma L” functionality. I expect that the phasing analyses will not change much, but what will change is the expectation of future price movement. And that after all is what my quest is all about – predicting the direction of future price movement. If one is trading daily bars and apparent “cycles” of 1-2 months maximum, how many longer period cycles need to be looked at? For example, if the best fit straight line over 24 months is used to detrend the data, then the cycles remaining are detected and subtracted from the price data until nothing is left but “noise” we ignore in this level of trading, cannot the linear trend just be extrapolated for the short term of 1-2 months, to “represent” the rest of the longer cycles being ignored? I understand, and know that it is not exactly easy to establish the periods and phase shifts of the relevant cycles, but this is where THT comes in. I don’t think that you are “missing” anything. Of course it is impossible to consider an infinite number of cycles – in fact Hurst recommended “at least TWO”. Using THT you can determine the status, or “phasing” of several cycles in most cases (depending on how much data you have analysed). I would be very careful of the “extrapolation” you mention. If extrapolating a line representing all longer cycles was at all mathematically sound then I would have had THT follow that relatively simple process. There is a good deal of mathematical conjuring that happens when it comes to extrapolating lines into the future, and in my experience it is all no better than guesswork. THT uses the cycle wavelengths to project into the future, using a “pattern building” process, not in a way that is similar to the extrapolation of lines using a mathematical process such as linear regression. Hello to all, I am new here and have just read the article above…..
As per TIME, I have been using combinations of TIME to forecast possible turns for a while now. I had the idea a cpl of years ago that the mkts had to be DYNAMIC therefore the analysis had to be dymanic aswell, I got the most recent move and then the largest move in the same direction and put on the current turn point that fit the price calculations, and when combining TIME AND PRICE in this manner it is amazing how well it works. I do it on the Daily first, then the Hourly and can break cycles down very well. This takes consistant monitoring of all the cycles, but working down from the larger to the smaller becomes easier as you get used to it. I am no expert, but keeping it simple and having patience to see what occurs are the best qualties that can be mastered. When I work out how to post images I will post to show what I mean. Your approach sounds very interesting. You should post to the Hurst Trader’s User Forum about it, where you can also post pictures, and there is a good deal of discussion about trading the markets using various cyclic theories. This page accepts text comments only.